There’s a hard dealership truth those of us in this business confront every day: Staff turnover is incredibly high. According to Cox Automotive’s Dealership Staffing Study, the average annual turnover at a dealership is 40 percent, with an astounding 67 percent turnover rate for salespeople. Most dealers know turnover affects their business, but many dealers think there’s nothing they can do about it. “Turnover has always been high; that’s just the way this business is,” dealers say. “If the market slows down, I guess that means my business slows down,” they lament. 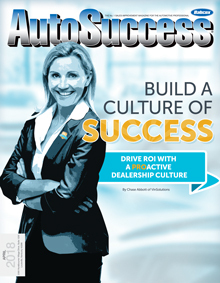 Many dealers fail to recognize that improving dealership culture can play a huge role in alleviating both of these pain points. They fail to recognize the ROI of proactivity. A key attribute of a proactive dealership culture is cross-departmental communication. Opening the lines of communication across all departments, especially between sales and service, can pay dividends almost immediately. One way to do this is by taking advantage of the integrations offered by your dealership software providers. Take the VinSolutions Connect CRM and Xtime integration as an example. Once the two systems are integrated, the two databases communicate with each other, which allows you to send customers more relevant, personalized offers in real time. For example, your integrated systems will be able to tell you that a customer in positive equity is coming in for service today, giving you a great opportunity to connect with a sales-ready customer. The integration also allows for salespeople to schedule first service appointments with their customers before they ever leave the showroom floor, a small extra step that can provide huge returns when it comes to building customer retention. According to Cox Automotive’s Maintenance and Repair Study, customers are 2.3 times more likely to return to a dealership for service when they are introduced to the service department at the time of sale. Another key step in building a proactive culture is critically evaluating your team. Many dealerships are structured based on old customer shopping patterns that revolved around showroom visits, but today, 60 percent of the car-buying process is done online. Maybe it is time to restructure the role of your business development center to focus on data mining or revamp your Internet lead process. Also, consider the role that your vendors play in your team’s day-to-day functioning. At VinSolutions, for example, we offer ongoing performance management, which can help your team stay on track with new processes and goals. There are many reasons employee turnover rate in dealerships is as high as it is, but one likely culprit is low job satisfaction. If your dealership isn’t set up to give your employees a chance to proactively engage with customers and create opportunities, they are likely left feeling frustrated and unfulfilled. And those feelings have an impact on your bottom line. On average, low-level engagement leads to a 33 percent decrease in operating income and 11 percent decrease in earnings growth. However, when you commit to proactive dealership culture – one that emphasizes work-life balance and doesn’t use the number of hours clocked as the primary measure of success – your employees will be more engaged. That pays. High-level engagement equates to a 19 percent increase in operating income and 28 percent increase in earnings growth on average. And if that’s not enough, you’ll also get more done; happier people are 12 percent more productive. Ready to learn more about how your dealership can Go Pro? Visit vinsolutions.com/gopro for additional insights and resources. 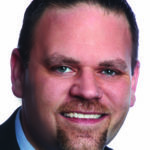 Click here to view more solutions from Chase Abbott and VinSolutions.